So today I thought it would be fun to revisit a color palette that has always been near and dear to my heart! I don't know what it is, but I've always been drawn to the way that navy blue looks with shades of pink. Today, I've paired navy with the prettiest shades of pink I could find. Patterns have always been such a great way to add visual interest. And with this round up of stripes and polka dots, I'm feeling all kinds of inspired. I love the idea of dressing your bridesmaids in navy blue dresses like these and then accessorizing with pretty pops of pink. And I don't know about you, but this beautiful wedding invitation had me at hello. Rounding out this look, I made sure not to forget to include a pretty cake. Wait, okay, scratch that... this cake is worthy of being called gorgeous! And those bouquets? Ahhh! So pretty if you ask me. So what do you think? Are you liking the way that these colors play off one another? 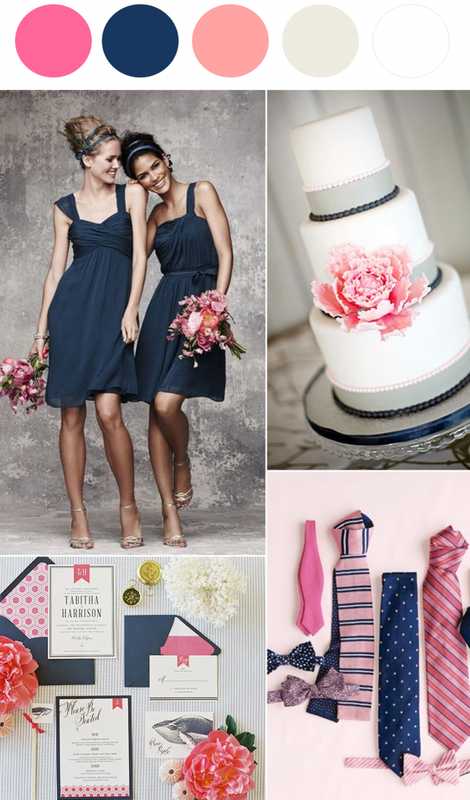 13 Comments " Now Trending: Navy Blue and Pink "
Such a classic color pairing–love it! Oh for the love of preppy cuteness, I am in love with this palette! You are always making me rethink things- I was never drawn to this palette before - I love your spin on this! Seriously gorgeous and so much fun with those preppy patterns!! This is so preppy and adorable! I'll always love this color combo! I say hell yes! So preppy and fun! One of my favorite combinations! Love it! That cake is perfection! Love this color palette. Oh I LOVE IT! So pretty! I LOVE this! Such a classic look. When I was planning my own wedding, I saw a color palette similar to this and immediately fell in love. So much so that 3 weeks before my wedding I told everyone we were switching gears. My family had to have a full intervention with me! But I'm still over the moon for this color combo! Many thanks from France for your inspiration which help me a lot in my choices! But after the rise of home video cartier replica in the 1980s, many of us began taping the shows we loved in order to watch them on our time. We were no longer at the mercy of the TV listings, because rolex datejust replica we decided the time we'd watch our programming: We were shifting the time the show aired for our personal convenience http://www.lakesideshopping.com/store1.html.